The Illinois Department of Transportation announced that regularly scheduled inspections of the I-80 bridges over the Des Plaines River, in Joliet, will begin April 29, weather permitting. Daily lane closures will be required, starting with the westbound bridge until May 6, when inspections begin on the eastbound bridge. Inspections on both bridges are expected to be complete by May 11, weather permitting. The closures will take place between 8:30 a.m. and 2:30 p.m., Monday through Thursday and Saturdays, if necessary. A minimum of two lanes will remain open while inspections are taking place. Motorists can expect delays and should allow extra time for trips through this area. Drivers are urged to pay close attention to flaggers and signs in the work zones, obey the posted speed limits and remain alert for workers and equipment. The inspections are being done in conjunction with an upcoming yearlong maintenance project on both bridges. Any additional issues discovered during the inspections will be addressed once construction begins in the field later this summer. The larger project, currently under contract, involves steel repairs and bearing replacements. The process for fabricating new parts as already begun, with work on the bridges expected to start in June or July. The repairs will be taking place under both structures, with any necessary lane closures scheduled at night to avoid disrupting traffic during the daytime hours. The project will be finished next summer. Click here to find details on other construction projects in IDOT’s District 1. Updates on the impacts to traffic are available at www.travelmidwest.com. 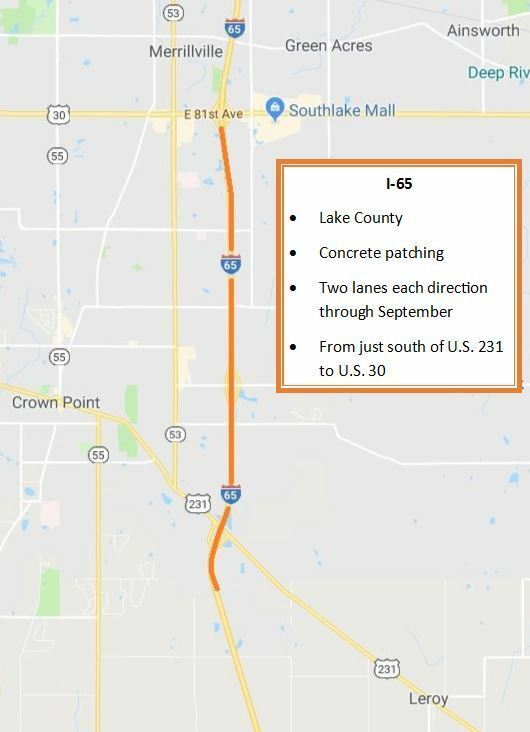 LAKE COUNTY – The Indiana Department of Transportation (INDOT) announces that a concrete patching job is set to begin Monday on I-65 in Lake County, from U.S. 30 to just south of U.S. 231. Throughout the project - which is expected to last through September - two lanes of traffic will be maintained in each direction. During the first phase, starting Monday, crews will be setting up a traffic crossover and placing barrier wall with two lanes moving in the right lane and outside shoulder on the southbound side and in the right two lanes on the northbound side. Then, in late May, two lanes of traffic will flow in each direction on the southbound side of the road while crews patch in the northbound lanes. In mid-July, traffic will be switched to the northbound side while crews work on the southbound lanes. Drivers in Northwest Indiana can monitor road closures, road conditions, and traffic alerts at any time via the District’s social media channels: www.Facebook.com/INDOTNorthwest or Twitter @INDOTNorthwest. Or visit http://www.trafficwise.in.gov for INDOT’s TrafficWise Traveler Information Service. Next Level Roads is Governor Eric J. Holcomb’s initiative to elevate Indiana’s economic competitiveness and quality of life for all Hoosiers through investment in transportation infrastructure. This sustainable, data-driven plan dedicates more than $30 billion over the next 20 years to improving the conditions of existing roads and bridges – both state and local, finishing major projects, and building for the future. Next Level Roads is enhancing Indiana’s position as a leader in freight and logistics and empowering cities, towns and counties to build communities that attract jobs and talent. Learn more about Next Level Roads at in.gov/indot. INDOT empowers businesses to deliver Indiana to the world and bring the world to Indiana by providing a transportation network that is second to none. The agency builds and maintains more than 28,000 lane miles of highway and 5,600 bridges, and provides oversight for 117 public aviation facilities and more than 4,000 miles of active rail lines. Indiana ranked as the #1 state in the U.S. for infrastructure in CNBC’s 2016 “Top States for Business” ranking. Learn more about INDOT at in.gov/indot. This service is provided to you at no charge by Indiana Department of Transportation. Click here to receive Silver Alerts. CHICAGO – The Illinois Department of Transportation announced that improvements to the bridge carrying U.S. 30 over Thorn Creek, in Chicago Heights, will require lane closures between Edgewood Avenue and Illinois 1 (Chicago Road) beginning, weather permitting, Wednesday, May 1. The project consists of substructure repairs, reconstruction of bridge joints and a new concrete overlay. Access to all businesses will be maintained in the work zone. The work is expected to be complete by the end of July. Motorists can expect delays and should allow extra time for trips through this area. Drivers are urged to pay close attention to flaggers and signs in the work zones, obey the posted speed limits and be on the alert for workers and equipment. Click here to find details on other construction projects in IDOT’s District 1. CHICAGO – The Illinois Department of Transportation announced that improvements to Barrington Road from Higgins Road (Illinois 72), in Hoffman Estates, to Lake Street (U.S. 20), in Hanover Park, will require daily lane closures beginning, weather permitting, Monday, April 29. The project consists of routing, cleaning and sealing cracks in the existing pavement as well as restriping for increased visibility. The work is expected to be complete by the end of June. CHICAGO – The Illinois Department of Transportation announced that patching, resurfacing and pedestrian ramp upgrades on Archer Avenue between Ashland Avenue and State Street, in Chicago, will begin, weather permitting, Wednesday, May 1. In order to complete the project, traffic will be restricted to one lane in each direction. Pedestrians can expect temporary sidewalk closures. CHICAGO – The Illinois Department of Transportation announced that the Illinois 47 and Plato Road intersection in Kane County will be reconstructed into a roundabout beginning, weather permitting, May 20. In order to complete the project, traffic on Illinois 47 will be shifted to temporary pavement. Plato Road will be closed at Illinois 47 beginning in early June, with traffic detoured to Kendall Road, McDonald Road, Illinois 47 and Burlington Road. The project is expected to be complete by October. Overnight ramp closures are scheduled next week at the Waukegan Road Interchange on the Eden Spur Tollway (I-94) to complete ramp improvement work. Electronic message signs and construction signage will be put in place in advance to alert drivers to the ramp work. The ramp closures are necessary to safely provide a work zone for asphalt paving on the ramps. On Monday, April 29, beginning at 10 p.m., the ramp carrying traffic from eastbound I-94 to Waukegan Road is scheduled to close to traffic until 5 a.m. on Tuesday, April 30. Drivers will have the option to exit at the Lake Cook Road Interchange prior to Waukegan Road Interchange. Two additional nights of similar closures will be needed to complete the work. The work is being coordinated with the Illinois Department of Transportation, Cook County and the Village of Northbrook, as well as local fire and police departments. Reconstruction of the ramp carrying traffic from eastbound I-94 to Waukegan Road Waukegan Road started last year as part of improvements to the Edens Spur. The full closure is needed to complete the final asphalt surface on the ramp to provide a smoother driving surface and extended life of the ramp pavement. The Edens Spur Improvement Project is removing and replacing all existing mainline asphalt pavement and replacing or repairing mainline bridges. Additional work includes replacing the Pfingsten Road Bridge, repairing the Waukegan Road Bridge over the Edens Spur, constructing the barrier separated median with stormwater improvements and upgrading ITS and roadway lighting. All work is scheduled to be complete in 2020. Originally constructed in 1958, the Edens Spur consists of two lanes in each direction with 4-foot wide inside shoulders and 11-foot wide outside shoulders and an open grass median. Up to 57,000 vehicles use the Edens Spur daily. These repairs are necessary to extend the life of the roadway and provide safe and convenient travel for Tollway customers. This work is part of the Tollway’s 15-year, $14 billion capital program, Move Illinois: The Illinois Tollway Driving the Future. Maps and construction about the Edens Spur Tollway repairs are available on the Tollway’s website at Illinoistollway.com via the Interactive Tollway Map and under “Projects Overview” in the Explore Projects section. The Illinois Department of Transportation announces that IL-111 will be closed to all traffic between Madison Avenue/Hawthorne Street and Rand Avenue in Roxana from 7 a.m. to 7 p.m. Saturday, April 27. This closure is needed to perform work on an overhead pipe bridge for the Phillips 66 Wood River Refinery. A marked detour will be implemented utilizing Hawthorne Street, IL-3, and IL-143 to circumvent the closure. Drivers are urged to pay close attention to changed conditions and signs in the work zones, obey the posted speed limits, refrain from using mobile devices and be alert for workers and equipment. Updates on the impacts to traffic are available at http://stl-traffic.org. For IDOT District 8 updates on Twitter, follow us at http://twitter.com/IDOTDistrict8. The Illinois Department of Transportation announced that improvements to the bridges on Kingery Highway IL-83) over Ogden Avenue (US-34) and the BNSF Railroad tracks just west of the West Hinsdale station will require lane closures beginning, weather permitting, May 14. The project consists of installing a new deck surface and making repairs to the bridge joints. In the first phase of the project, traffic will be reduced to one lane in each direction and shifted to the northbound lanes. Future phases will shift traffic to the southbound lanes. Portable message signs will inform motorists of these changes as they occur. The work is expected to be complete by the end of November. The Illinois Department of Transportation announced that overnight lane closures are scheduled starting May 1 on I-80 in Joliet for the installation of shoulder rumble strips, part of several traffic and safety improvements planned throughout the corridor. Eastbound: Sunday through Thursday from 8 p.m. to 5 a.m. the following morning; Friday from 8 p.m. to 10 a.m. Saturday; and Saturday from 8 p.m. to noon Sunday. Westbound: Sunday through Thursday from 9 p.m. to 6 a.m. the following morning; Friday from 9 p.m. to 10 a.m. Saturday, and Saturday from 9 p.m. to noon Sunday. To help manage congestion, the closures will occur in stretches of no more than five miles. The project is expected to be complete by mid-June. Along I-80, in addition to the rumble strips, IDOT is planning to install overhead digital message boards to better relay traffic conditions, as well as working to expand Emergency Traffic Patrol to assist in incident management. The department also is rebuilding the interchange at U.S. 30, with new ramp alignments and capacity enhancements on I-80. The Illinois Department of Transportation announced that a resurfacing and patching project on US-14 from Western Avenue, in Des Plaines, to Vernon Avenue, in Park Ridge, will require daytime lane closures and sidewalk closures beginning this week. In addition to the resurfacing, the project includes the installation of sidewalk pedestrian ramps. Overnight lane closures could be possible during the course of construction. The project is expected to be complete by the end of October. The Illinois Department of Transportation announced that resurfacing and patching of Northwest Highway (US-14) from Vail Avenue, in Arlington Heights, to State Street, in Des Plaines, will require daytime lane closures and sidewalk closures beginning, weather permitting, this week. In addition to the resurfacing, the project consists of the installation of new sidewalk pedestrian ramps. There will be no lane closures Monday through Friday from 7 a.m. to 9 a.m. for eastbound lanes and 4 p.m. to 6 p.m. for westbound lanes. The work is expected to be complete by June 2020. The Illinois Department of Transportation announced that two projects to improve pavement conditions and safety on Butterfield Road (IL-56) are scheduled to begin, weather permitting, in early May. Resurfacing and installing rumble streets between the CN Railroad overpass just west of IL-59 and the Kane County line, between Warrenville and North Aurora. Construction will start May 1, weather permitting, with a late June completion day. Resurfacing and installing pedestrian ramps and traffic signals from Naperville Road to IL-53, in Wheaton. Construction will start May 6, weather permitting, with a late October completion day. The Illinois Department of Transportation announced that a project to replace culverts and make other drainage improvements on US-20, in Hampshire, will require lane closures at two locations beginning, weather permitting, May 13. The projects are both over Harmony Creek: On US-20 near the intersections with Getty Road and Big Timber Road. Traffic will be reduced to single lanes controlled by traffic signals at both locations. Beginning in July, Getty Road will be closed for the duration of the project. A detour will direct traffic to Harmony Road and Big Timber Road. The work is expected to be complete by December. Beginning the week of April 29th, 2019, the existing southbound right turn lane of Randall Road at the McDonald/Stearns road intersection will be closed for approximately two weeks for underground storm sewer installation, as well as asphalt patching. Motorists will still be able to turn westbound on McDonald Road from Randall Road, using the southbound through lane.